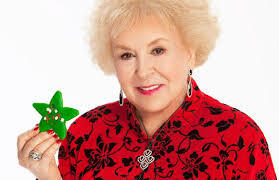 I love Marie Barone in the sitcom Everybody Loves Raymond. Sure she’s a bit meddlesome. Admittedly she’s even a tad overbearing. Maybe she’s even off-putting to some. But her motivation is pure. She’s committed to her family. She really never puts herself first—even if we are led to believe that she does. If we are really paying attention, her scheming is done to ensure that her family is safe and sound and well-fed. No matter what, it is always important that they eat. As a mother of three sons, I get how my own feeling of peace is tied to the care and feeding of my boys—and so I instinctively understand why Marie is forever handing food to whomever walks through the door. “Are you hungry, dear?” she asks while handing over a plate—without any regard to the answer. Now, as my own sons grow older and the prospects of one day becoming a mother-in-law myself become a real possibility, I take note of mothers-in-law in a new way. And Marie Barone is at the top of my list. I’ve got to admit, I think she’s great. But she does give me pause. It is a daunting thought to recognize that my own quirks and traits and defects will be borne by future daughters-in-law who enter the family. These young women won’t be required to love or honor me through sheer genetic material. And that worries me a bit. After all, I see how often Marie is misunderstood. She makes me wonder if my future daughters-in-law may expect me to be a more perfect version of their own mother. My head starts swirling when I think of mother-in-law-hood. If being a mother is a difficult task, how much more so being a mother-in-law? My own mother-in-law has been a real blessing to me. She has loved and welcomed me but has also respected my own boundaries and decisions as a mother. I’m sure she was very worried in the first decade or so. She didn’t always hide her concern if I was taking good care of her precious son—which may well have boiled down to if I was feeding him; but all in all, I think she’s pleased with the job I’ve done almost three decades later. Throughout the years, she has often told me how fortunate I am to have married her son. I’m not sure I always agreed (hey, he was lucky, too!) but now that my own sons are young men, I totally get that sentiment. I see my sons growing into wonderful young men who take their work seriously, have goals and ambition, are kind and respectful to everyone—and I know that their future wives will be blessed, indeed. I realize that I may even have to voice that fact now and again. I’m entitled, right? Regardless of what the future holds in my life as a mother-in-law, I am grateful to Marie Barone. No excuses, just commitment. Take it or leave it. Whatever you do, though, please make sure to eat.